Semiconductor-based Ultra-Fast All-Optical Signal Processing Devices –a key technology for the next generation of ultrahigh bandwidth optical communication systems! The introduction of ultra-fast communication systems based on all-optical signal processing is considered to be one of the most promising ways to handle the rapidly increasing global communication traffic. Such systems will enable real time super-high definition moving pictures such as high reality TV-conference, remote diagnosis and surgery, cinema entertainment and many other applications with small power consumption. The key issue to realize such systems is to develop ultra-fast optical devices such as light sources, all-optical gates and wavelength converters. Ultra-Fast All-Optical Signal Processing Devices discusses the state of the art development of semiconductor-based ultrafast all-optical devices, and their various signal processing applications for bit-rates 100Gb/s to 1Tb/s. 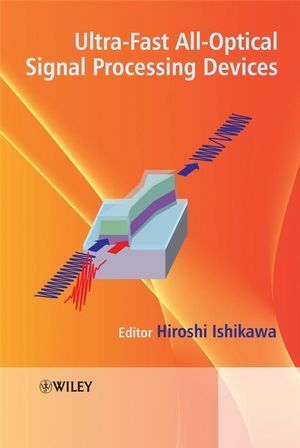 This invaluable reference will provide device researchers and engineers in industry, researchers at universities (including graduate students, and post doctorial researchers and professors) and research institutes with a thorough understanding of ultrahigh bandwidth optical communication systems. Device and communication market watchers will also find this book useful. Dr Ishikawa is the Director of the Ultrafast Photonic Devices Laboratory in National Institute of Advanced Industrial Science and Technology (AIST) in Japan. He worked for research and development of optical semiconductor devices in Fujitsu Labs Ltd from 1972 to 2001. In 2001 he moved to Femtosecond Technology Research Association Central Res. Lab. as a group leader of ultrafast all-optical switching devices. He is at AIST since 2004. He is a member of Japan Society of Applied Physics, The Physical Society of Japan, The Institute of Electronics, Information and Communication Engineers, and IEEE (Fellow).